My great-grandfather, James Patrick Kelleher, and his mother, Johanna Barrett Kelleher, sometime between 1918 and 1921. The one on the right is the World War I Victory Medal with three Battle Clasps (maybe you can blow up the original photo to see the names on the clasps). The left one is the World War I Croix de Guerre (War Cross) as issued to many American soldiers. a bronze star for those who had been mentioned at the regimetn or brigade level. a silver star, for those who had been mentioned at the divisionlevel. Really interesting would be the names on the battle clasps or bars! Maybe the original photo or scan is of better quality than this one? 3C – 3rd Infantry Division (Marne Division) 10/24/18 – present. Organized at Camp Green, North Carolina in 1917. Stopped the last of the German offensives at the Marne. Three white diagonal stripes (for 3rd Division) from R to L on blue (for loyalty) square patch. Three stripes stand for three major campaigns in WWI: Marne, St. Mihiel and the Meuse-Argonne (these might be the battle bars!). I think he has one double chevron on his lower sleeve which should indicate he was a corporal. A triple would indicate a sergeant. The collar badge intrigues me a little. It's clearly an Infantry badge (two crossed rifles) but literature indicates there should be a letter on it too. On the right side of his collar he would have another round badge saying "US 100" which idicates he was a member of the regular army, or the same with the letters NG superimposed for a member of the national guard, NA for National Army or R for National Reserve. Last edited by Hans; Oct 10 2012 at 04:14 AM. You are very welcome AnnMarie. I've done this many a time for descendants of emigrants to the USA (up to and uncluding reports on deployment and battles) and even for Anne! (first world war exploits of her dad). It's simply amazing what you can unearth these days. And I mean that digitally though Belgian farmers, believe it or not, STILL plow up boms, shells and ammo! Last edited by Hans; Oct 12 2012 at 05:49 AM. I love really old photographs of family. AnnMarie, you must be really thrilled to have all that detail about the uniforms and medals. Did the GG come home? I really need to see if I can dig out a few of my older photos. I don't have to many. The really old ones in the family were all kept by Aunt...so I haven't seen them for years and I have no idea who has them now...drat!! Lily...I'm with you...I love to look at old family pics...I don't seem to care who's family, just seeing real people who came before us is very interesting to me...it's the faces...I love the faces and what they seem to say about the person. Oh yes, he came home. By WWII, he was working in the NJ ship yards. He died in 1994... the day before his 97th birthday. His brother Michael came home after being severely wounded... he died two months later. AT least he WAS home when he passed. He's buried near his parents.The oldest brother, William, also came home. We don't know much about him, since he had already moved out when he was drafted, and living in Ohio rather than Pa. So far, Jeff hasn't even found a picture of him. I just received a couple of really old black and white photos from a friend, showing my family in about 1953. If I can figure out how to post them here I will do that. Cosy family photos, Priscilla. Ypu're the little girl in them, right? They are lovely, as are you. Last edited by Hans; Jan 23 2013 at 02:57 PM. Yes, Hans. That's my mother, father, brother and myself. Taken in Sept. 1953. I was born in May of 1952. I was cute, back then. . .
Cilla, seeing that photo of you made me go mother and daughter and I had to think of my three sisters and my mother, of whom the third anniversary of her passing is now so close. Here's my oldest sister Nelly with mum and dad, gosh knows where. I can ask my sister but I doubt she'll remember where it was taken. It's obviously an attraction of some kind and since she was born in 1944 I guess the photo must have been taken in 1947 or 1948. And here's one with all my three sisters (my brother and me are the youngest of the bunch and then he's still 5 years older than I am). Ever since we went looking through photos and scanned a whole bunch of things, I've been meaning to share some with all of you. 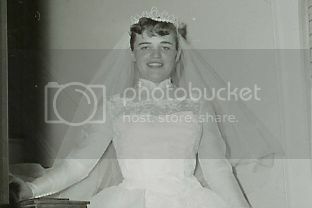 Even as I'm posting some of these photos of my grandmother (my father's mother), my eyes are still watering a little bit. Everyday things get easier though. 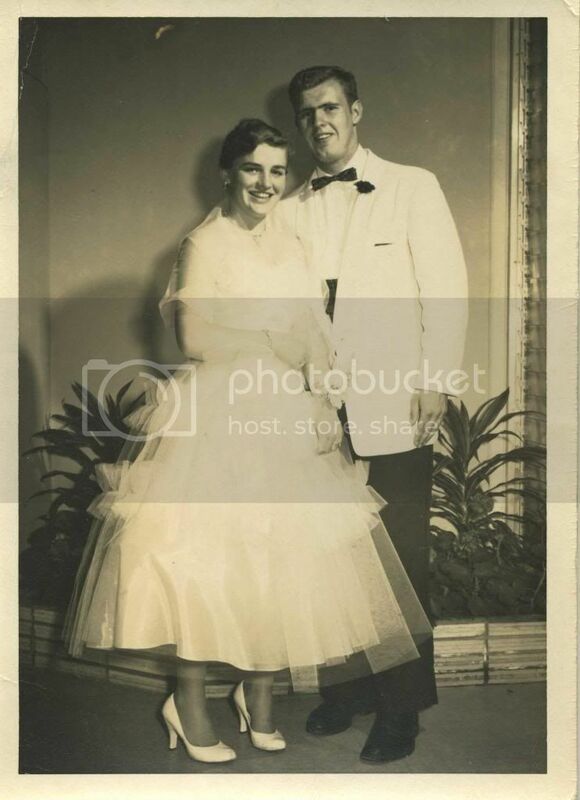 This one is my grandmother and my grandfather heading off to senior prom. 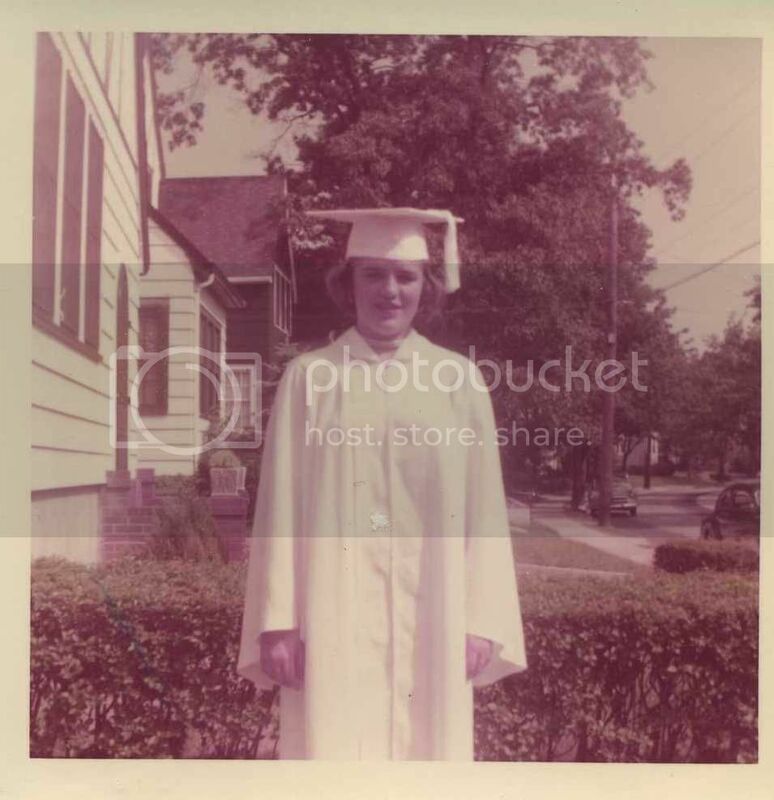 This one is my grandmother's high school graduation in 1956. 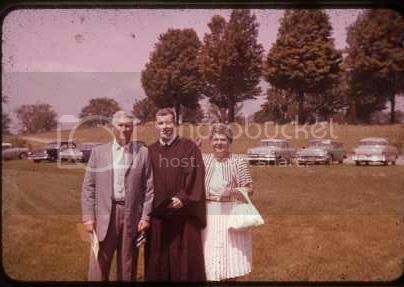 This one is my grandfather and his parents when he graduated from Bucknell. This one is self-explanatory, but I never knew a time when my father's parents were married because they got divorced many years before I was born. Finally this photo is old in the sense that it was taken almost a month ago. 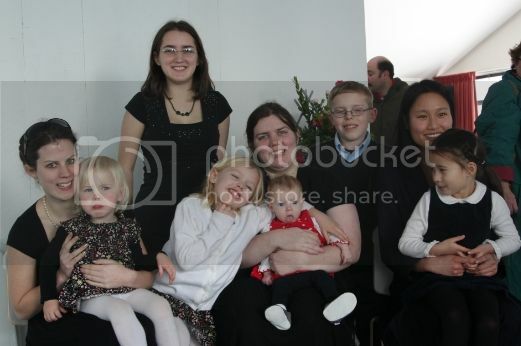 These are all the cousins on my father's side of the family. I'm the one holding the baby. The four kids with blonde hair belong to my father's youngest sister. The young Chinese girl belongs to my uncle, and she's sitting on the lap of my uncle's step-daughter which leaves the remaining two as my younger sisters. This photo is really bittersweet for me. I'm happy that we have it because it's not easy for everyone to get together, but it was taken at the reception for my grandmother's funeral. I also know that having this photo taken would have made her very happy. She was always insistent on having family portraits done when everyone was together. Actually, that's a baby girl. My mother took the photo, and there are several more shots, but this just happens to be the best one where everyone has normal faces, and just about everyone is looking at the camera. Mom found more! So I spent a few hours yesterday scanning. One, I had asked her for, because Daddy always had it on the wall. It was taken in 1941, of him and his uncle, who I believe was also his godfather, James Patrick Kellrher Jr.
Daddy in 1962. He broke his leg PLAYING BASEBALL, of all things! My grandfather, Thomas William Lear Sr, around 1919. Before they had boy clothes for boys younger than 6. My grandfather, his brother James and sister Mary. James died when my dad was around 12. Mary was hit by a car when she was 7. And from Mom's side... My great-grandmother Rosalia Darmofal Chmielewski who was born in Poland. The children are my Uncle Stan, my Uncle Leon, my mom Joann and my Aunt Carolyn. Based on my mom's apparent age, this was taken in 1947 or 48. 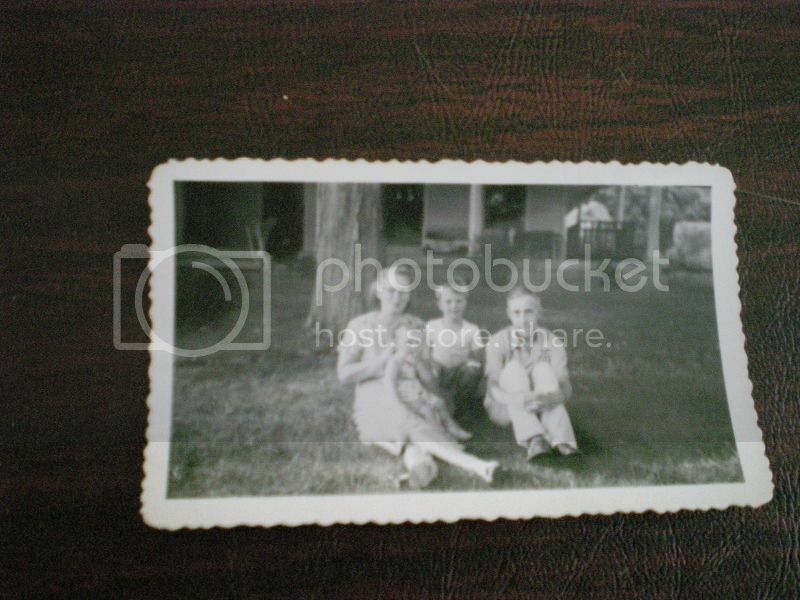 A gorgeous set with old family photos, AnnMarie! I especially like the first two. And also the photo of your grandfather that was taken in 1919 (the year of birth of my father!). Have you looked closely at his toy? An absolutely wonderful wooden locomotive. I'd love to know what happened to that train, Hans. It is adorable, and it was probably well-cared for, if I know anything about my grandfather! Recalled a story about Dad's prom: He went with one girl, switched dates with a friend at the prom (They'd taken each other's girlfriends because they'd both had arguments with the girls about a week before). Daddy had Uncle Mike's old jeep that night... and the young lady in the picture lost her shoe through a hole in the floorboard on the way home! LOL, what a story. Who'se the girl in the photo then? Miss Right or Miss Temporary? I have some more things to share, too. I would have done it when I posted the other photos, but I had to locate the flash drive that we were copying things onto. All of these photos come from my father's side of the family. 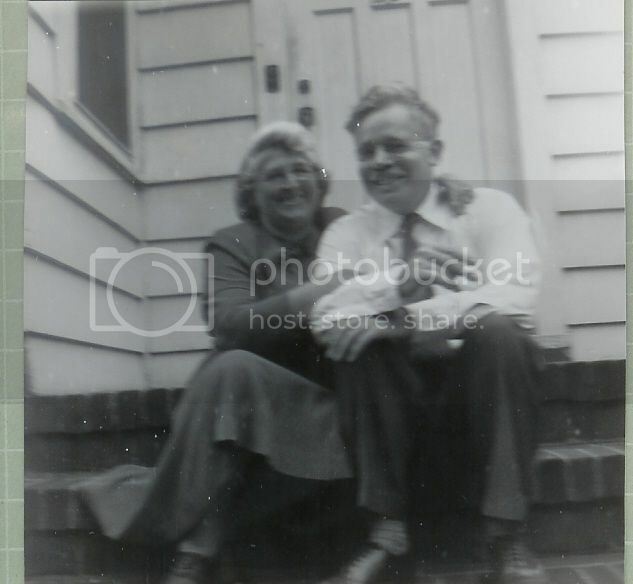 These are my grandmother's parents. 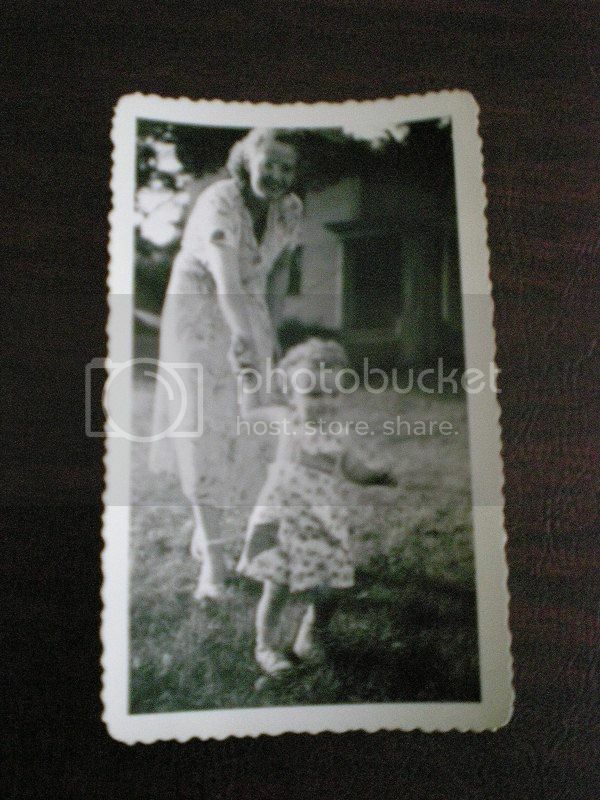 There are not a lot of pictures of my great-grandmother, and she passed away when my grandmother was about 17, according to what my father remembers her telling him. My grandmother definitely takes after her mother's side of the family. 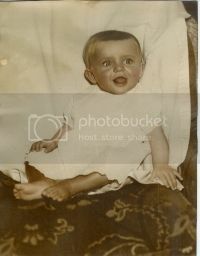 This is one of the few baby pictures that we have of my grandmother. 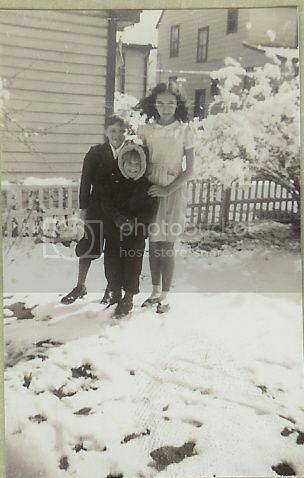 This one is my grandmother with her brother and sister. My grandmother is the youngest of the three. 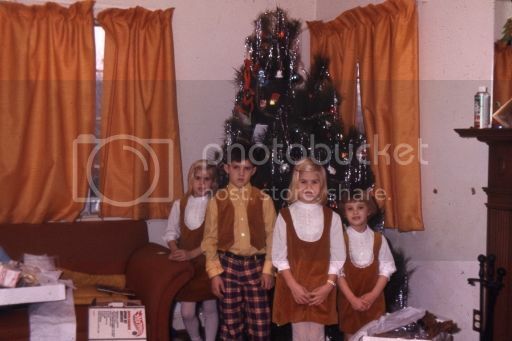 This is my father with the three siblings who existed at the time this photo was taken, or at least forced into the photo. I'm not exactly sure if my uncle had been born by the time this was taken. It could be the year before he was born, or it could be the Christmas he was born, and he just wasn't put in the picture. Anyway, I'm posting this picture because my grandmother made the jumpers and the vest my father is wearing. She had tons of that fabric, and the Christmas stocking she made me is made from the same fabric. I'll have to find a good picture of my Christmas stocking later because most of the Christmas photos are in a location that isn't my laptop. Going from left to right: my great-grandfather, my great-great grandfather, and my grandfather who is holding my father. 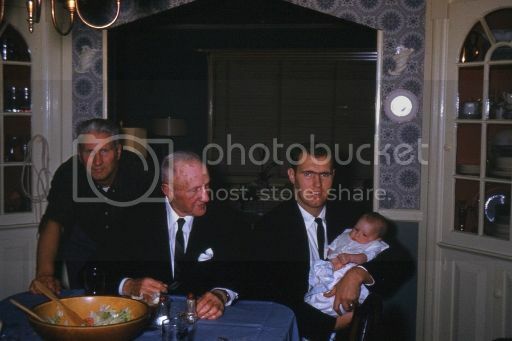 Somewhere floating around my house, there is a picture of me as a baby with my father, my grandfather, and my great-grandfather. 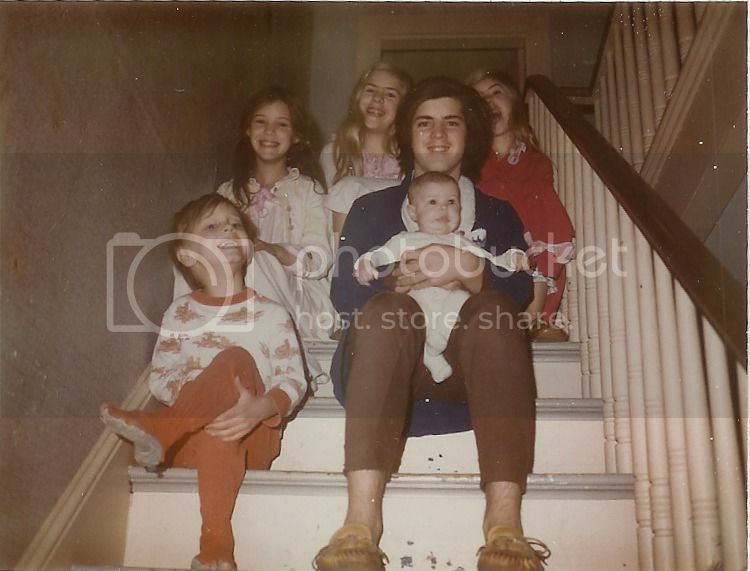 Finally, for this post at least, this is my father with his four sisters and his brother. This is a Christmas photo, and it is family tradition that pictures are taken on the stairs before anyone is allowed to look in their stockings or open any presents. In case any of you are wondering, my father is 14 years older than his youngest sister. And the 4 generations picture is priceless! They were ALL Miss Temporary. Dad started writing to my Mom when he was stationed in Korea. It is a nice tradition, and it felt so weird this year without my grandmother there, and we had no idea that she was going to leave us a few days later. She was always the one taking the picture forcing all the kids and grandchildren on the stairs. It was just one those times when there was no arguing with her. She was in charge of taking the picture no matter how many cameras were there, and no one else was allowed. 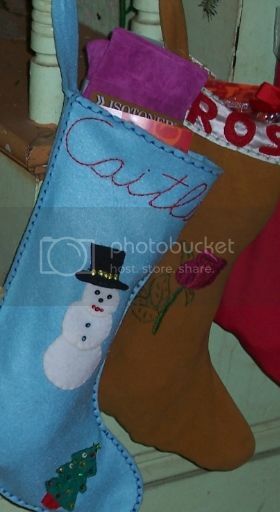 Speaking of Christmas, I located a decent photo of my Christmas stocking to go along with the vest and jumpers photo. It's partially blocked by the stocking of one my sister's, but that's my own fault since I'm the one who hung them on the bannister. There are decorations on the back of my stocking, too, but no one every takes a picture of the back. If I remember correctly, there is another embroidered rose on the back, but it's different than the one on the front, and there are small Christmas wreaths on the cuff. 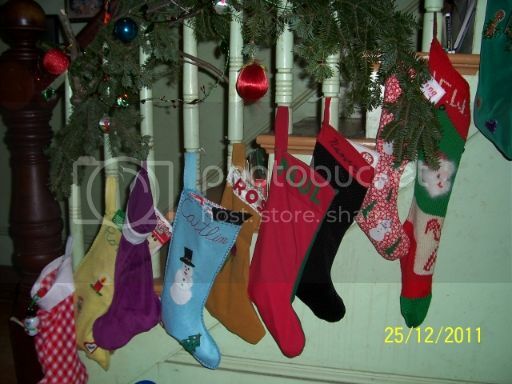 While I was at it, I thought I'd post a picture of some of the other stockings, too. There are a few more that didn't fit into the picture, but my grandmother had a hand in making almost all of them. The only one is this picture she didn't make was my mother's which is the one made of yarn, and it's a completely different shape from the others. If I recall correctly, my mother's was made by one of her mother's sisters, and her brothers have similar stockings. My grandmother was incredibly crafty. She made clothes, crocheted, embroider, and knitted. All of us have these pieces of her, and I treasure each and every one of them.